While doing some research on intellectual property protection recently I came across an interesting bit of trivia: Calvin’s dad was a patent attorney. Yes, that Calvin. The over-imaginative little imp with the exasperated parents and ever-present stuffed tiger. The six-year old bundle of energetic societal self-reflection who ruled the funny pages from 1985 to 1995. As I read the link and reminisced about how I, along with millions of others, enjoyed getting to know Bill Watterson’s iconic comic creation, I was reminded how Watterson himself became less amused by his brainchild and more tormented by him. Or at least by the demands foist upon him by the expectations of both his fans and of his syndicate. Although Watterson’s own father was a patent attorney, I couldn’t help but wonder if the real reason he chose the profession for Calvin’s dad was inspired in part by his desire to protect his intellectual property. I then recalled an interview the reclusive Watterson gave to the web site Mental Floss in October 2013 in which I found his take on that issue both surprising and refreshing. Mental Floss: I’m assuming you’ve gotten wind of people animating your strip for YouTube? Did you ever mimic cartoonists you admired before finding your own style? Watterson: Every artist learns through imitation, but I rather doubt the aim of these things is artistic development. I assume they’re either homages or satiric riffs, and are not intended to be taken too seriously as works in their own right. Otherwise I should be talking to a copyright lawyer. Mental Floss: Owing to spite or just a foul mood, have you ever peeled one of those stupid Calvin stickers off of a pickup truck? 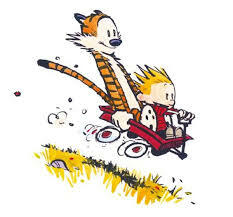 Watterson: I figure that, long after the strip is forgotten, those decals are my ticket to immortality. Watterson’s wistful dismissal of his imitators belies his true feelings on the subject of protecting his intellectual property. Indeed, he took his artistic and creative integrity so seriously that, even at the height of Calvin and Hobbes’ popularity, he decided to end the strip rather than risk falling into the trap of banal repetition or succumbing to the persistent demands to grant licensing. A novel way to protect one’s artistic creation, I suppose. Yet, in Watterson’s case, one that has been effective.